Early in 1917 Russia collapsed. By this time the enormous strain of the war was telling hardly upon all the European populations. There had been a great disorganization of transport everywhere, a discontinuance of the normal repairs and replacements of shipping, railways, and the like, a using-up of material of all sorts, a dwindling of food production, a withdrawal of greater and greater masses of men from industry, a cessation of educational work, and a steady diminution of the ordinary securities and honesties of life. Nowhere was the available directive ability capable of keeping a grip upon affairs in the face of the rupture of habitual bonds and the replacement of the subtle disciplines of peace by the clumsy brutalities of military «order». More and more of the European population was being transferred from surroundings and conditions to which it was accustomed, to novel circumstances which distressed, stimulated, and demoralized it. But Russia suffered first and most from this universal pulling up of civilization from its roots. The Russian autocracy was dishonest and incompetent. The Tsar, like several of his ancestors, had now given way to a crazy pietism, and the court was dominated by a religious impostor, Rasputin, whose cult was one of unspeakable foulness, a reeking scandal in the face of the world. Beneath the rule of this dirty mysticism, indolence and scoundrelism mismanaged the war. The Russian common soldiers were sent into battle without guns to support them, without even rifle ammunition; they were wasted by their officers and generals in a delirium of militarist enthusiasm. For a time they seemed to be suffering mutely as the beasts suffer; but there is a limit to the endurance even of the most ignorant. A profound disgust for the Tsardom was creeping through these armies of betrayed and wasted men. From the close of 1915 onwards Russia was a source of deepening anxiety to her Western allies. Throughout 1916 she remained largely on the defensive, and there were rumors of a separate peace with Germany. She gave little help to Rumania. On December 29th, 1916, the monk Rasputin was murdered at a dinner-party in Petrograd, and a belated attempt was made to put the Tsardom in, order. By March things were moving rapidly; food riots in Petrograd developed into a revolutionary insurrection; there was an attempted suppression of the Duma, the representative body, attempted arrests of liberal leaders, the formation of a provisional government under Prince Lvoff, and an abdication (March 15th) by the Tsar. For a time it seemed that a moderate and controlled revolution might be possible-perhaps under a new Tsar. Then it became evident that the destruction of confidence in Russia had gone too far for any such adjustments. The Russian people were sick to death of the old order of things in Europe, of Tsars and of wars and great powers; it wanted relief, and that speedily, from unendurable miseries. The Allies had no understanding of Russian realities; their diplomatists were ignorant of Russian, genteel persons, with their attention directed to the Russian Court rather than Russia, they blundered steadily with the new situation. There was little goodwill among the diplomatists for republicanism, and a manifest disposition to embarrass the new government as much as possible. At the head of the Russian republican government was an eloquent and picturesque leader, Kerensky, who found himself assailed by the deep forces of a profounder revolutionary movement, the «social revolution», at home and cold-shouldered by the Allied governments abroad. His allies would neither let him give the Russian people land nor peace beyond their frontiers. The French and the British press pestered their exhausted ally for a fresh offensive, but when presently the Germans made a strong attack by sea and land upon Riga, the British Admiralty quailed before the prospect of a Baltic expedition in relief. The new Russian republic had to fight unsupported. In spite of their great naval predominance and the bitter protests of the great English admiral, Lord Fisher (1841-1920), it is to be noted that the Allies, except for some submarine attacks, left the Germans the complete mastery of the Baltic throughout the war. The Russian masses were resolute to end the war. There had come into existence in Petrograd a body representing the workers and common soldiers, the Soviet, and this body clamored for an international conference of socialists at Stockholm. Food riots were occurring in Berlin at this time, war weariness in Austria and Germany was profound, and there can be little doubt, in the light of subsequent events, that such a conference would have precipitated a reasonable peace on democratic lines in 1917 and a German revolution. Kerensky implored his Western allies to allow this conference to take place, but, fearful of a world-wide outbreak of socialism and republicanism, they refused, in spite of the favorable response of a small majority of the British Labour Party. Without either moral or physical help from the Allies, the «moderate» Russian republic still fought on and made a last desperate offensive effort in July. It failed after some preliminary successes and another great slaughtering of Russians. The limit of Russian endurance was reached. Mutinies broke out in the Russian armies, and particularly upon the northern front, and upon November 7th, 1917, Kerensky’s government was overthrown and power was seized by the Soviet Government, dominated by the Bolshevik socialists under Lenin, and pledged to make peace regardless of the Western powers. Russia passed definitely «out of the war». In the spring of 1917 there had been a costly and ineffective French attack upon the Champagne front, which had failed to break through and sustained enormous losses. Here, then, by the end of 1917, was a phase of events altogether favorable to Germany, had her government been fighting for security and well being rather than for pride and victory. But to the very end, to the pitch of final exhaustion, the people of the Central Powers were held to the effort to realize an impassible world imperialism. To that end it was necessary that Britain should be not merely resisted, but subjugated and in order to do that Germany had already dragged America into the circle of her enemies. Throughout 1916 the submarine campaign had been growing in intensity, but hitherto it had respected neutral shipping. In January 1917, a completer «blockade» of Great Britain and France was proclaimed, and all neutral powers were warned to withdraw their shipping from the British seas. An indiscriminate sinking of the world’s shipping began which compelled the United States to enter the war in April (6th) 1917. Throughout 1917, while Russia was breaking up and becoming impotent, the American people were changing swiftly and steadily into a great military nation. And the unrestricted submarine campaign for which the German imperialists had accepted the risk of this fresh antagonist, was far less successful than had been hoped the British navy proved itself much more inventive and resourceful than the British army; there was a rapid development of anti- submarine devices under water, upon the surface, and in the air; and after a month or so of serious destruction, the tale of submarine sinkings declined. The British found it necessary to put themselves upon food rations; but the regulations were well framed and ably administered, the public showed an excellent spirit and intelligence, and the danger of famine and social disorder was kept at arm’s length. Yet the German imperial government persisted in its course. 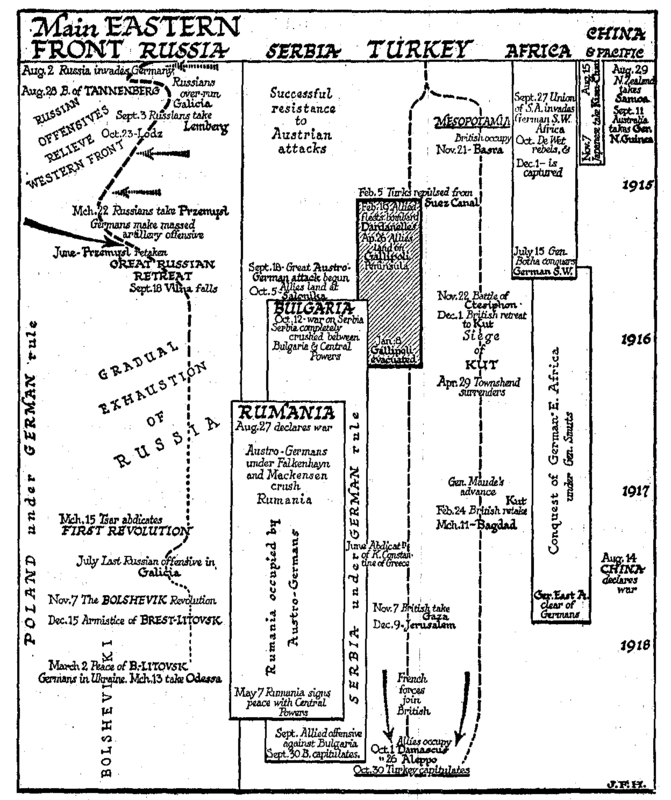 If the submarine was not doing all that had been expected, and if the armies of America gathered like a thunder-cloud, yet Russia was definitely down; and in October the same sort of autumn offensive that had overthrown Serbia in 1915 and Rumania in 1916 was now turned with crushing effect against Italy. The Italian front collapsed after the Battle of Caporetto, and the Austro-German armies poured down into Venetia and came almost within gunfire of Venice. Germany felt justified therefore, in taking a high line with the Russian peace proposals, and the peace of Brest Litovsk (March 2nd, 1918) gave the Western allies some intimation of what a German victory would mean to them. It was a crushing and exorbitant peace, dictated with the utmost arrogance of confident victors. All through the winter German troops had been shifting from the Eastern to the Western front, and now, in the spring of 1918, the jaded enthusiasm of hungry, weary, and bleeding Germany wits lashed up for the one supreme effort that was really and truly to end the war. For some months American troops had been in France, but the bulk of the American army was still across the Atlantic. It was high time for the final conclusive blow upon the Western front, if such a blow was ever to be delivered. The first attack was upon the British in the Somme region. The not very brilliant cavalry generals who were still in command of a front upon which cavalry was a useless encumbrance were caught napping; and on March 21st, in «Gough’s Disaster», the fifth British army was driven back in disorder. The jealousies of the British and French generals had prevented any unified command of the Allied armies in France, and there was no general reserve whatever behind Gough. Thousands of guns were lost, and scores of thousands of prisoners. Many of these losses were due to the utter incompetence of the higher command. No less than a hundred tanks were abandoned because they ran out of petrol! The British were driven back almost to Amiens. Through out April and May the Germans rained offensives on the Allied front. They came near to a break through in the north, and they made a great drive back to the Marne, which they reached again on May 30th, 1918. This was the climax of the German effort. Behind it was nothing but an exhausted homeland. The Allied politicians intervened in the quarrels of their professional soldiers, and Marshal Foch was put in supreme command of all the Allied armies. Fresh troops were hurrying from Britain across the Channel, and America was now pouring men into France by the hundred thousand. 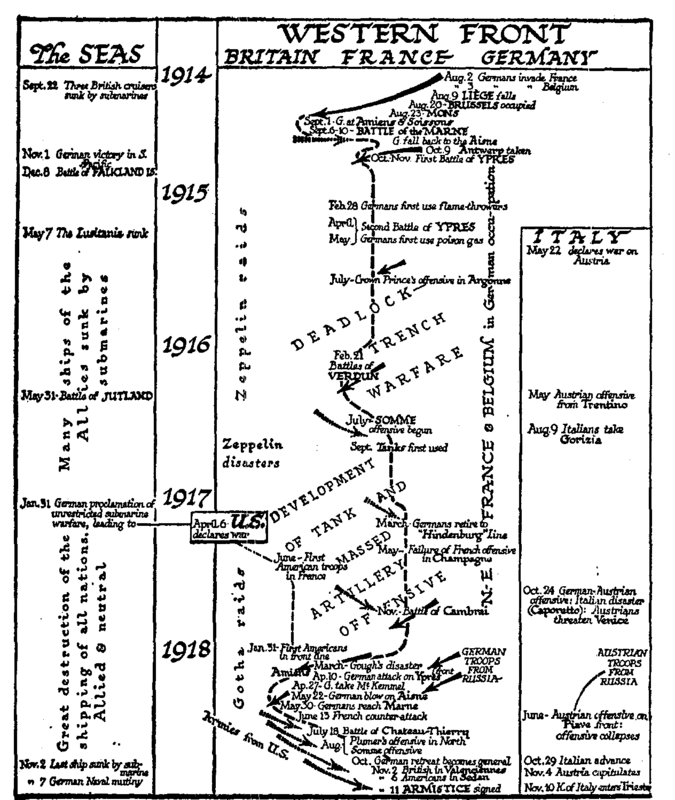 In June the weary Austrians made a last effort in Italy, and collapsed before an Italian counterattack. Early in June Foch began to develop a counter-attack in the Marne angle. By July the tide was turning, and the Germans were reeling back. The Battle of Chateau Thierry (July 18th) proved the quality of the new American armies. In August the British opened a great and successful thrust into Belgium, and the bulge of the German lines towards Amiens wilted and collapsed. Germany had finished. The fighting spirit passed out of her army, and October was a story of defeat and retreat along the entire Western front. Early in November British troops were in Valenciennes and Americans in Sedan. In Italy also the Austrian armies were in a state of disorderly retreat. But everywhere now the Hohenzollern and Habsburg forces were collapsing. The smash at the end was amazingly swift. Frenchmen and Englishmen could not believe their newspapers as day after day they announced the capture of more hundreds of guns and more thousands of prisoners. In September a great allied offensive against Bulgaria had produced a revolution in that country and peace proposals. Turkey had followed with a capitulation at, the end of October, and Austro-Hungary on November 4th. There was an attempt to bring out the German Fleet for a last fight, but the sailors mutinied (November 7th). For four years and a quarter the war had lasted, and gradually it had drawn nearly everyone in the Western world, at least, into its vortex. Upwards of ten millions of people had been actually killed through the fighting, another twenty or twenty-five million had died through the hardships and disorders entailed. Scores of millions were suffering and enfeebled by under-nourishment and misery. A vast proportion of the living were now engaged in war work, in drilling and armament, in making munitions, in hospitals, in working as substitutes for men who had gone into the armies and the like. Business Men had been adapting themselves to the more hectic methods necessary for profit in a world in a state of crisis. The war had become, indeed, an atmosphere, a habit of life, and a new social order. Then suddenly it ended. In London the armistice was proclaimed about midday on November 11th. It produced a strange cessation of, every ordinary routine. Clerks poured out of their offices and would not return, assistants deserted their shops, omnibus drivers and the drivers of military lorries set out upon journeys of their own devising with picked-up loads of astounded and cheering passengers going nowhere in particular and careless whither they went. Vast vacant crowds presently choked the streets, and every house and shop that possessed such adornments hung out flags. When night came, many of the main streets, which had been kept in darkness for many, months because of the air raids, were brightly lit. It was very strange to see thronging multitudes assembled in an artificial light again. Every one felt aimless, with a kind of strained and aching relief. It was over at last. There would be no more killing in France, no more air raids and things would get better. People wanted to laugh, and weep and could do neither. Youths of spirit and young soldiers on leave formed thin noisy processions that shoved their way through the general drift, and did their best to make a jollification. A captured German gun was hauled from the Mall, where a vast array of such trophies had been set out, into Trafalgar Square, and its carriage burnt. Squibs and crackers were thrown about. But there was little concerted rejoicing. Nearly everyone had lost too much and suffered too much to rejoice with any fervor.